I use powershell a lot at work – I’m not a guru by any means and I often find it hard to remember the commands I have run in a session, either for future use or for documenting in my time sheet (which also acts as a point of reference for future helpdesk tickets). When I started going through the Powershell in a month of lunches book (which I highly recommend or the Powershell v3 book) I decided to use the start-transcript commandlet to record all my powershell activities. This worked very well until I would scroll through several screens worth and then forget what file I had saved my transcript too. There was also the possibility of forgetting to transcript everything. My next step was to include the time in the powershell prompt – this enables me to go back through the transcript and see how long it took to run the commands for my timesheet entries. Remembering back to the good old dos days, I remembered the prompt command. A quick bit of experimenting with the Date command I had the current time displayed at the beginning on the Powershell prompt. Note this is displayed after the previous command is run, so technically it’s not the exact current time, but the time that the prompt was displayed on the screen. $log="c:\temp\powershelllogs-" + $env.username + (get-date -uformat "%y%m%d-%H%M") + ".txt"
This ends up with a powershell prompt that looks like the following. Hope this brief posting inspires you to change your powershell prompt to be even more useful for you. “The update is not applicable to your computer”. It turns out that this is actually because .net framework 4 (or higher) has not been installed. The full .net 4 framework package is available at http://www.microsoft.com/en-us/download/details.aspx?id=17718 or you could install the newer 4.5 framework at http://www.microsoft.com/en-us/download/details.aspx?id=30653. Make sure that you close the false powershell installation before attempting the .net installation or the .net will try to install for about 5 minutes on your computer and then complain that another install is already in use and does not give you the option to retry. You can only abort and then run the whole installation again. All in all a pretty bad user experience for trying to install the software. Thanks to the Troubleshooting guide for the beta version of Powershell 3 that tipped me off for the pre-reqs which are not mentioned on the original download page for Powershell 3 and unfortunately there is no place on that web page to provide feedback. 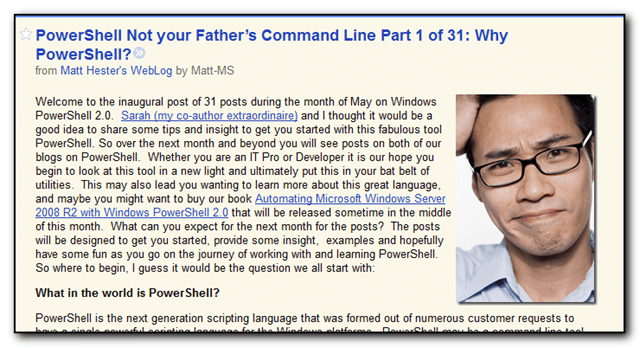 Scripting Guys blog formatting – now in html format. On my way home from work late the other night I was listening to episode 152 of the Mind Of Root Podcast where Keith and Steve interviewed Ed Wilson from the Hey Scripting Guy! blog. It was a really interesting podcast and explained their goals to get users learning Powershell and push out some best practice ideas. So far I like the power of Powershell but I’m finding the learning curve pretty steep. Especially as I can do a lot of my scripting requirements within a normal dos batch file in a lot fewer lines than Powershell requires. However I do understand that Powershell provides a lot more functionality, especially when built into products such as BPOS, exchange etc. 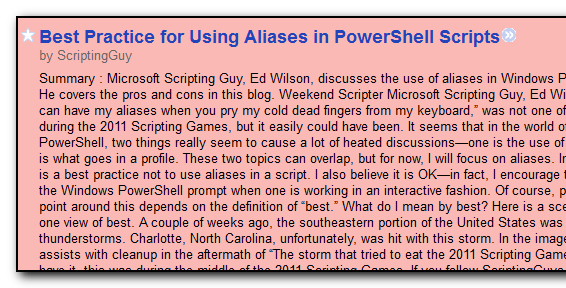 The next weekend I found Ed’s scripting blog, read a few articles, commented on one about using streams.exe to unblock zip files (been there, done that – very frustrating to find out you should unblock a zip file before extracting many thousands of files) and then subscribed to the blog feed. looked horrendous when viewed in Google reader – there are no line breaks, text formatting or anything else that makes the blog post easy to read. I’m not quite sure why the post is a garish pink colour either, but I could live with that. 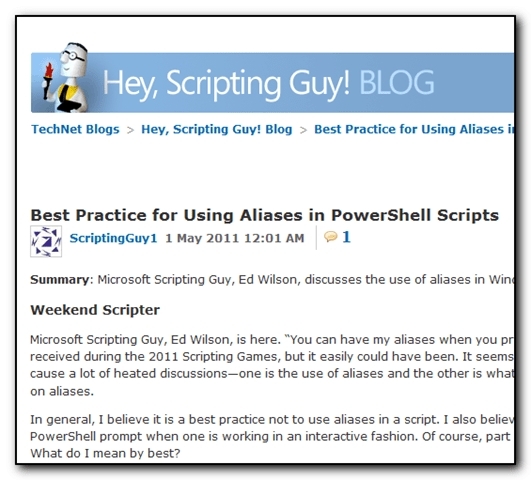 A quick look through other blogs hosted on blogs.technet.com show that formatting can be preserved (see Matt Hesters Blog feed) below so I sent an email to Ed Wilson to see if the settings could be changed. He responded back the next day and said he would pass the request onto the webmaster. Since then I’ve been checking the rss feed and the website and today everything is displaying correctly (it looks like the switch started yesterday). So thanks to Ed and the Technet website admins – the change is really appreciated. Hopefully this makes the reading of the blog easier for everyone else too! Enabling powershell to run scripts with registry permissions. As part of my powershell work I obviously need to run powershell scripts. I tried to run one last night and got the usual message about scripts needing to be signed. I had previously changed the settings on my XP machine, but this was obviously the first time I had run a script on my Windows7 machine. Answering Yes to the prompt I then got the following error message – “Set-ExecutionPolicy : Access to the registry key ‘HKEY_LOCAL_MACHINE\SOFTWARE\Microsoft\PowerShell\1\ShellIds\Microsoft.PowerShell’ is denied”. Sure enough I don’t have permission to this registry key. To set it domain wide, you need to download the PowerShell group policy templates from Microsoft and follow the instructions to set up a policy. The other powershell script I worked on was to retrieve a detached mailbox that was still retained in exchange, archive the mail to a pst file, move the pst file to the managers home directory and then delete the mailbox again. The following script does this – note some paths are hardcoded and I already have a temporary account in AD called tempuser that does not have a mailbox. This is the account that the deleted mailbox is attached to. The main disadvantage to this method is that at the end of the script all of the detached mailboxes will appear as tempuser in the exchange console. In this particular script I also do very little error checking as this was designed for my use but hopefully helps others too. $Host.UI.RawUI.WindowTitle = "attaching mailbox to tempuser account"
$Host.UI.RawUI.WindowTitle = "Sleeping 60 until moving mailbox"
$Host.UI.RawUI.WindowTitle = "Moving pst file to managers mailbox"
$newpst=$newdir + "\" + $user + ".pst"
$Host.UI.RawUI.WindowTitle = "disabling tempuser mailbox for reuse"